We might not know how much Ford's expecting for the Focus Electric, but it's already put a hefty $10,000 price tag on one of its accessories. The company announced today that it has teamed with SunPower to offer purchasers of the upcoming Focus Electric and C-MAX Energi a 2.5-kilowatt rooftop solar system. That setup will apparently provide "enough renewable energy production to offset the energy used for charging" cars that log 1,000 miles per month (about 30 miles per day) or less. If $10,000 is just a little too rich for your blood, there's always Best Buy's $1,500 budget-friendly charging station. Full PR after the break. 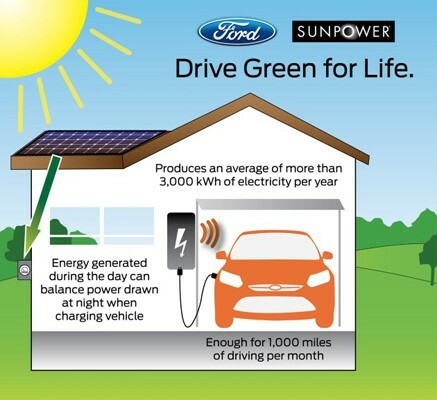 Ford teams with SunPower, offers EV owners $10,000 solar charging system originally appeared on Engadget on Thu, 11 Aug 2011 05:04:00 EDT. Please see our terms for use of feeds.